quantity: 3500pcs asst colors asking: $18.00 wholesale: style no. : smt description: This plush reversible throw will wrap you in welcome warmth, whether you’re quivering mid-winter or taking arms against the frigid air-conditioner on a hot summer night. One side mimics the luxe feel of mink, while the other emulates the coziness of lamb’s wool. Submit to the snuggliness. Surrender to the soft. 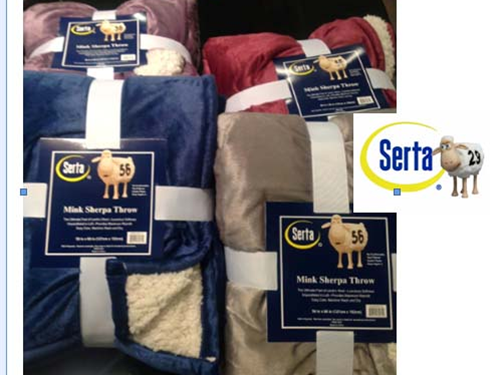 Thanks to Serta, you’ll never shiver again. Comes in 5 assorted colors. Made of 100% poly.